This is a 5-night, 6-day workshop. Your adventure begins at 10 a.m. on September 15, 2018 and ends after a final slideshow on the afternoon of September 20. Note: Deposit of $500 is required to reserve your spot at the workshop. Balance of $1250 due on June 17, 2018. Or, you may choose the "Pay in full" ticket if you desire to pay all at once. Last day for a cancellation request is June 16 (see details here). The workshop fee does not include transportation to and from the park, lodging, food or the park admission fee. For those who want a special challenge after the workshop, we're offering a hiking excursion to Dream Lake and Emerald Lake. This is a 1-afternoon, 1-night experience. We will begin in late afternoon on September 20 and end at about 1 a.m., or whenever everyone’s tired or creatively tapped. See below for full description and requirements. $400 + applicable taxes. After registering for the main workshop, you will receive a link to optionally register for this post-workshop hike. First come, first-served. Skill level: Anyone who completes the primary portion of the workshop should have the photography skills necessary for this location. This WORKSHOP HAS PASSED! Thanks for your interest. As with all Passport Series workshops, we will teach at this location only once. 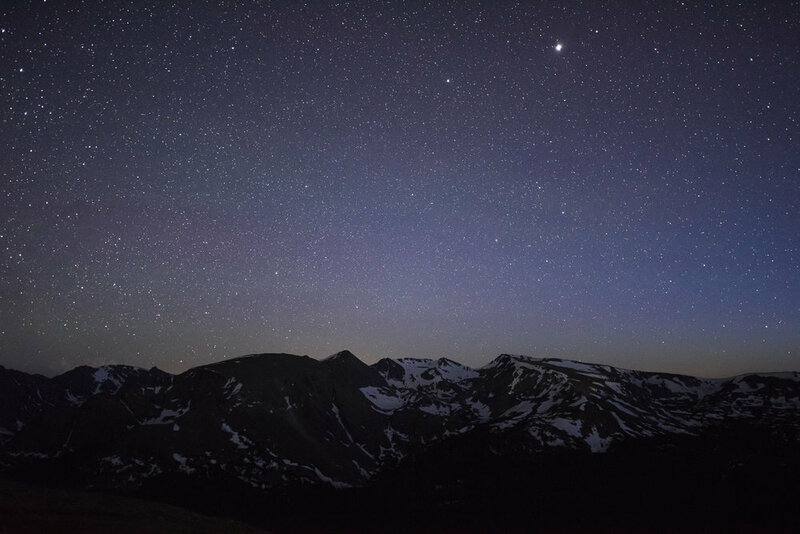 If you have a dream of making epic long exposures at night at Rocky Mountain National Park, we hope you join us. The Rocky Mountain range rises between the plateaus of the Midwest and the shores of the Pacific, and is one of the most awe-inspiring sights in North America. One of its showcase locations is in the heart of Colorado: Rocky Mountain National Park. The entire region teems with beautiful subjects for photography: alpine lakes and tundra, clear ponds and lakes, rippling rivers and majestic waterfalls, and of course mountain landscapes that recede miles into distant horizons. On this workshop, we will photograph them all. And with luck, we’ll get to shoot some snow on the peaks and some fall color on the mountainsides. We will begin on the eastern edge of the park, exploring the open meadows, aspen groves, lakes, valleys, mountain peaks and more. Then we’ll move on to the western side of the park, where we’ll explore rivers, marshes, lakes and a preserved historic settlement, all with the background of towering mountains and stunning night skies. The workshop will begin under a first quarter moon that will add a little light to our early evenings, before setting to give us dark skies for photographing the Milky Way over the Rocky Mountains. The second half of the workshop will feature a later-setting moon that will provide an evening full of moonlight fill for light painting. Each participant will have multiple opportunities to work one-on-one with Matt and Chris in the field, along with an optional group project toward the end of the workshop. This optional add-on is available only to workshop attendees. You'll get a link to purchase a ticket after registering for the main workshop. Emerald Lake. Photo by NPS/Jacob W Frank. As a small group, we will hike up to Dream Lake and Emerald Lake, two extraordinary locations that offer stunning photography opportunities. The hike is considered moderate, but with camera gear on your back, it will test your stamina. The round-trip length is about 4 miles, during which we will hike from about 9,400 feet in altitude to over 10,000 feet. This trip will require a level of fitness and physical ability higher than needed for the primary portion of the workshop. Along the way we’ll be treated to trickling cascades, a forest pond or two, and a spectacular—spectacular!—valley view. At our final destination we will be graced with two lakes perhaps unsurpassed in grandeur throughout the rest of the park. Crystal-clear waters reflect the surrounding treeline, while granite cliffs tower over Tyndall Gorge. We will begin the hike in late afternoon, giving us enough time to tour the locations in daylight and to scout for night photos, and we will stay until shortly after midnight, or until our endurance escapes us. This add-on adventure will not feature formal instruction, but the leaders will be available for questions and assistance. We look forward to you joining us for this epic experience in an beautiful alpine landscape. We hope to push you to step outside your comfort zone—to test the limits of what you and your camera can do. You’ll go home after the workshop with a solid grasp of photographing at night in an alpine environment, including mountain landscapes, ponds and lakes, meadows and moonlight. You are responsible for your airfare and car rental. (There is no need for four-wheel-drive or high-clearance vehicles.) If you are interested in sharing a car rental, let us know and we will try to connect you with someone in the group. We wholeheartedly encourage carpooling! The workshop will have two bases, the first of which will be in Estes Park, Colorado. Denver is the closest airport, and is generally inexpensive to fly into from most major cities, but also can have high prices for rental cars. Colorado Springs is further and can be more expensive to fly into, but often has better rates on cars. 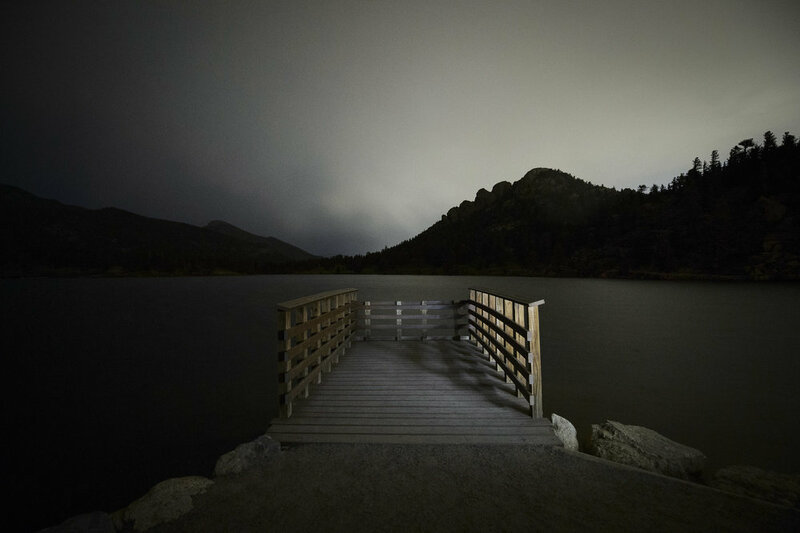 To facilitate easier access to and from the best night photography locations, the workshop will be based at hotels in destination towns on each side of the national park—Estes Park for the first three nights, and Grand Lake for the last two nights. You are not required to stay at the official workshop hotels, though doing so does make it easier to meet with the group each morning. Booking info and a group code will be sent after registering. Estes Park and Grand Lake are very different towns. The former, on the east side of the park, is scenic but busy, a bustling commercial gateway into an amazing national park. The latter, at the southwest corner of the park, is quiet and laid-back, rustic in a modern way, a great place to enjoy a morning cup of coffee at the edge of a rippling lake as the sun rises over the flanking peaks. Both have varied eating opportunities. Well, it’s the mountains, and we’ll be there during the transition from summer to fall. We may see fall color, we may see dustings of snow. Recommended attire: We may be able to wear shorts and a T-shirt during the day, but we’ll definitely want warmer options at night: bring long pants, a sweatshirt, and both a mild- and cold-weather jacket, along with a hat and gloves. We will spend all of our time at an altitude of 7,500 feet or more, and at least one night at about 12,000 feet. A thermal base layer is advised (synthetic blends that wick moisture and dry quickly are a good choice), and layering is most prudent. We also recommend a good pair or two of trail shoes. Because we’ll be working around a few alpine lakes and rivers, you may want one of those pairs of shoes to be waterproof. No vigorous activity will be required, but please consider your physical abilities in hot weather prior to registering. There will not be any long hikes during the primary portion of the workshop, but you should be comfortable carrying your own equipment over uneven ground in the dark. 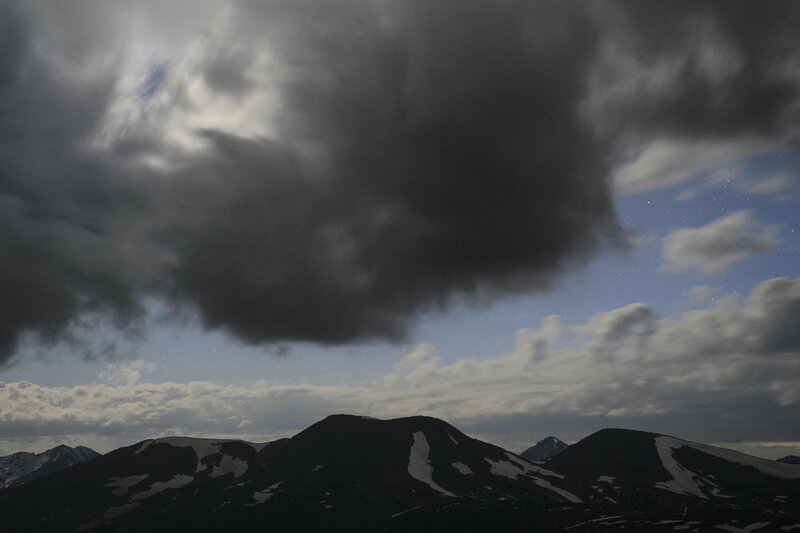 It should also be noted that we will be at altitude, including at least one evening in the alpine tundra at 12,000 feet. When that high in the mountains, it is important to stay very well hydrated and not to exert yourself beyond comfort level. If you are not accustomed to walking around at such elevations, it’s not a bad idea to arrive at the park a day or two before the workshop and venture on some short strolls to acclimate. Most people can get adequately accustomed to altitude within 48 hours. If you cannot get there early, don’t fret—just take it easy the first couple of nights, listen to your body, drink plenty of water, and you’ll be fine. Altitude sickness is a serious concern, but is easy to avoid, easy to recognize, usually harmless and generally treated by simply getting back to a lower altitude. But we’d be remiss not to mention it (several dozen times). Some of my favorite national park memories involve my brother. We’ve toured and photographed Yellowstone together, and Grand Teton, and Great Sand Dunes, and Bryce Canyon, and Acadia. We have also, more than once, hiked the trails of Rocky Mountain National Park. My brother lives in Denver, so we’ve ventured into the park a few times when I’ve visited, whether for business or family. We’ve experienced Rocky Mountain together enough so that I have multiple memories of sharing the park with him. One in particular stands out as one of most cherished national park moments of my life. In the winter of 2017, we spent a bit of time in the park so I could work on snow photos in the mountains. We ventured a few places, then began meandering on trails that weaved between lakes and pond in the lower-elevation forests. Or, I thought we were meandering. Upon visiting and walking over the fourth or fifth frozen lake of the day, the light was growing dark. Clouds blocked any view of the sky, and snow was quietly falling all around us. We began hiking back down the mountain, backtracking in what remained of our own footprints, now just light impressions in the surface of the freshly snow-filled landscape. Suddenly but surely, my brother pushed aside some tree branches and began to walk off trail. I called out that the way down was to the right, but he just motioned for me to follow him. We walked through some pines, trudged over some drifts, and angled up a large boulder jutting from the land. And suddenly before us appeared a vast valley, miles across. A snow-laced forest wonderland, bordered by magnificent mountains on all sides. The falling snow made the distant features just barely visible and nearly devoid of color. I felt as if I was looking at a Thomas Moran painting, or an Ansel Adams masterpiece. The light was fading quickly, and we still had to accomplish two more miles of hiking over snow to get back to the car. But all I could do was stand there and look, feeling the wind and the snow swirling around me, to gaze at a piece of this world so beautiful that even in that very moment, I knew I would never forget.